The Place is Cincinnati’s premiere family fun roller skating center! The Place is known for being one of the best roller skating rink in the tri-state, the Place was voted Cincinnati’s Best Roller Skating center by Cincinnati Family Magazine. 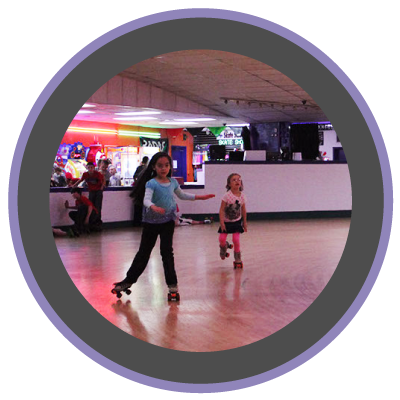 We are honored to receive the award and invite you and your family to come on out and see for yourself why we were voted Cincinnati’s best place to skate. Suit up in a vest and grab your phaser to start a laser tag adventure with your friends and family! With so much space, it’s even more fun to run, hide, and chase down other players! 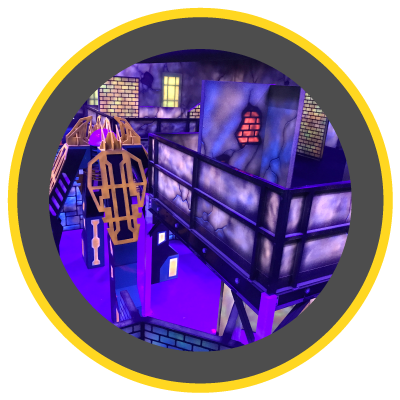 Kids of all ages will get sucked into this challenging, yet entertaining game that allows them to escape to a fantasy world of fun. Once time runs out, players will get a chance to see how their performance stacked up against the other players. The ropes course is a great way for kids to burn off energy, fine tune their motor skills, and have fun with their friends. Kids and adults who are afraid of heights will have the unique opportunity to face their fears head-on while also having fun on the ropes! This is a great teambuilding activity for corporate events as well. It encourages onlookers to support and cheer on their friends and co-workers. Strategize with your friends prior to getting behind the wheel so you can team up against your parents or favorite teacher. Put the pedal to the metal and try to avoid the bumps of your fellow rider’s cars. Each time someone bumps into you, your car will be sent into a 3-second spin that catches you off guard and adds to the fun and excitement. When the three seconds are up, you may find yourself face-to-face with another driver who is ready to send you spinning once again! 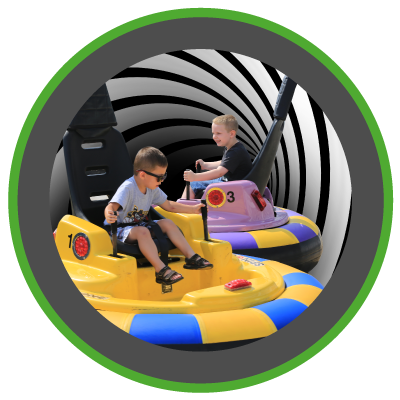 Kids love the heart racing, challenging adventures they face behind the wheel of a bumper car. When you push yourself to the limit, you can reach heights you’ve never dreamed of. Whether you’re testing your superhero skills, preparing for Mount Everest or simply conquering a fear of heights, you’ll find what you need here in the world of The Place. 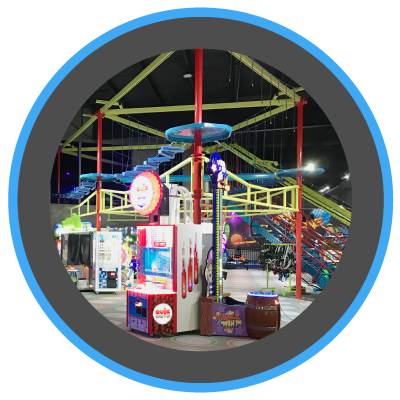 Step inside a world of fun and adventure in the arcade at The Place, located underneath the ropes course. 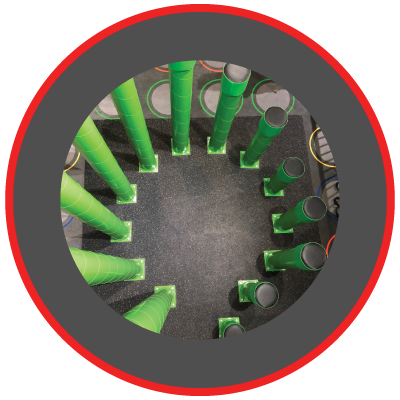 Start your journey by testing your driving skills at one of the classic racing-style games, or see how many points you can score by shooting basketballs through a hoop. Play on your own or grab a few friends and challenge each other to see who can score the most points. Parents, don’t be shy! 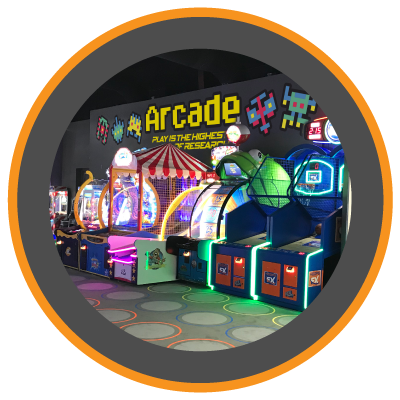 Guests of all ages are welcome inside the arcade to play one of the many entertaining games—so come on in and show your kids how it’s done!